Cosette Camille Sauls was born on April 29, 2015 shortly after 3pm weighing 6 pounds, 9 ounces, 20 and 1/4 inches long. She is fearfully and wonderfully made. 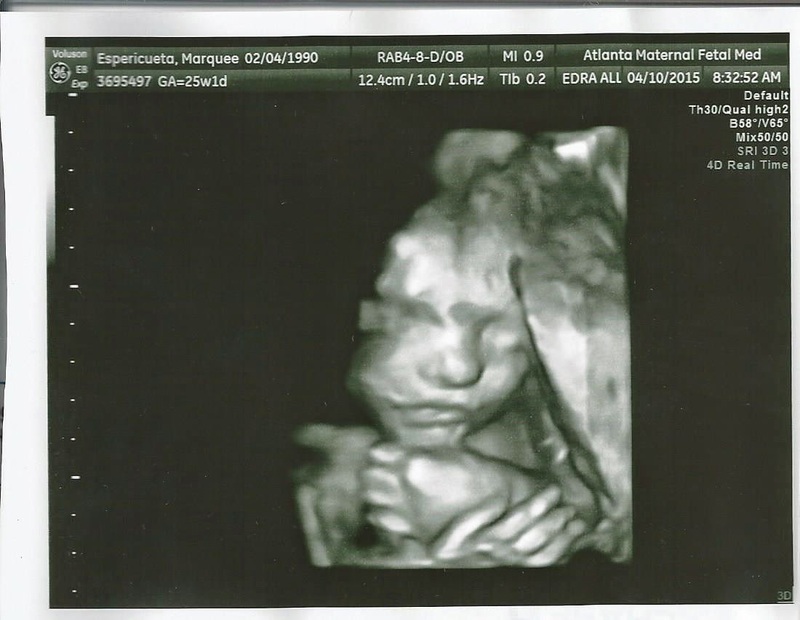 Next up: Oliver Joel Espericueta Sauls due in July! I'll do a more detailed birth story soon. I'm still pretty wiped out from our long day yesterday. 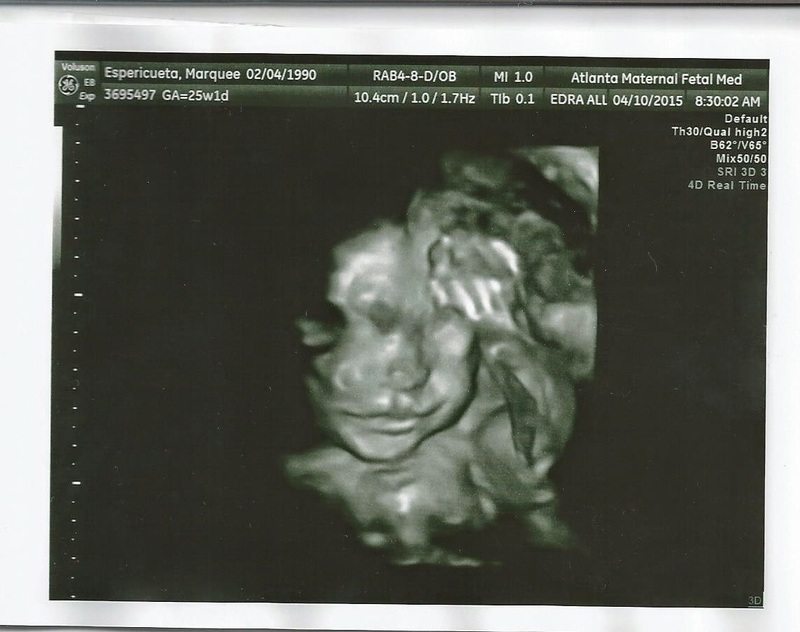 The highlight for me was sitting outside the delivery room with my ear pressed to the door listening for her first cry. The air here is heavy with anticipation! I took Austin and Tasha to run a few errands yesterday and we ran into many people who wished them luck on the birth of Baby Cosette. Living in a small town means that shopkeepers and workers remember you and, of course, it didn't take long for the people that work at the grocery store where Austin works (!) to learn that he was going to soon be a father. I'm excited but it still doesn't seem real. And I'm anxious about how things will go tonight and getting the timing down right where we will be there when Cosette is born but won't be sitting too terribly long. 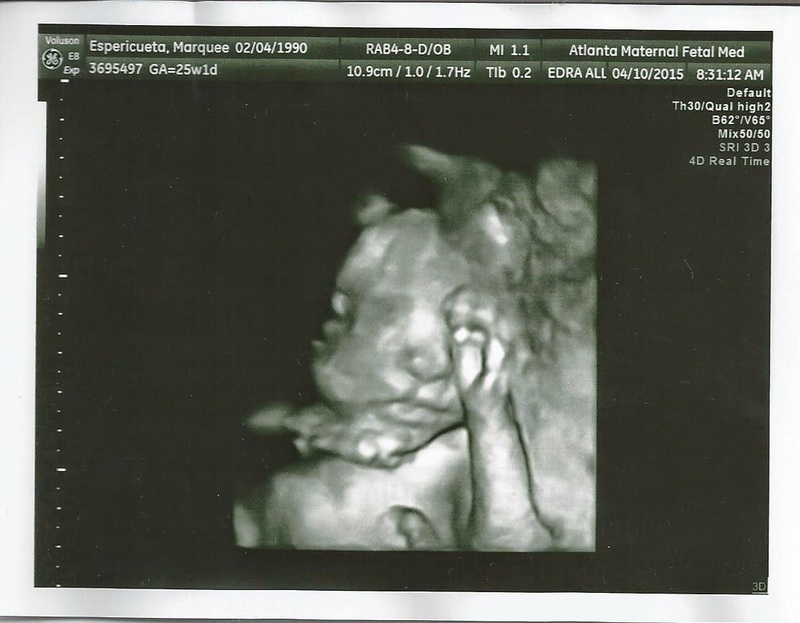 I don't think I mentioned yet that we have made the decision (me, Austin, Tasha and my mom) that my mom and I will wait until Tasha is at 3-4 centimeters or until early morning to go to the hospital, whichever goes first. I wanted to just knuckle through it but my back pain has been really, really bad over the past few days - which may or may not have something to do with me moving a recliner on Sunday - to the extent that I couldn't bend over well enough to wash my feet in the shower or dry them afterwards. Just killer muscle spasms that have me bent a little but won't let me bend very far, just sort of curved forward. If things go like I think they'll go, getting there first thing in the morning should give us plenty of time. Austin's dad and stepmom will come up tomorrow morning and Cody and Marquee will come up sometime during the day. Cosette (and Austin and Tasha) will have lots of love and support. 1. Starting with non-food items....my trusty old straightening iron broke a few weeks ago and I had to pick a new one. I hate having to make those kind of decisions because it's not like I can buy a new one every week. Whatever I get has to work. 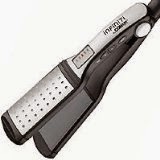 After reading a lot of reviews I chose the Infiniti Pro by Conair. I picked the two inch wide one and can I just say, without exaggeration, it has changed my LIFE! It has higher heat than I've had before - it goes to 455 degrees. It works so well that I can straighten my hair with one pass of the iron through my hair. My old process was to go through my hair a couple of times, wait a couple hours and go at it again and then I would have to still straighten again the next day. With this guy not only does it only take one pass through, it holds until I wash my hair again, regardless of the humidity. This is huge! Even when we had enough rain for there to be water in the basement with me keeping the window open my hair did NOT frizz! I typically only wash my hair once every 5 or 6 days. It took a long time to adjust the chemistry of my hair to not be greasy after a day or so but now it doesn't look greasy until close to a week. Being able to fix my hair only once or twice a week is heaven for me. Seriously, best flat iron ever. 2. Garnier sleek and shine is helping me keep my hair straight. 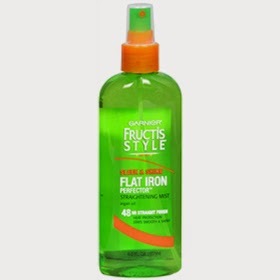 I use a flat iron heat protectant spray which helps protect the hair and also helps keep it straight. I didn't mention this with the flat iron but the sad truth about my hair is that even though it's naturally thick and curly I have to straighten it to curl it in anything other than wild curls. Wild curls get frizzy after just a few hours and I just feel messy and unkempt. I also use a serum from Garnier - just a tiny little drop of it - to keep my hair looking and feeling healthy. 4. Special K with Red Berries! I cannot get enough of this cereal. 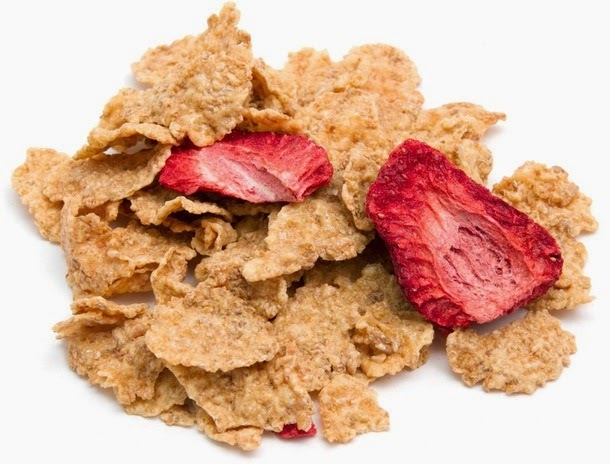 I am not a huge fan of fresh strawberries because they're a bit too tart but I find the dried strawberries in the cereal are perfect! I'm sure there are healthier cereals out there but this is better than having poptarts or danish and it gives me a little much needed fiber. 5. 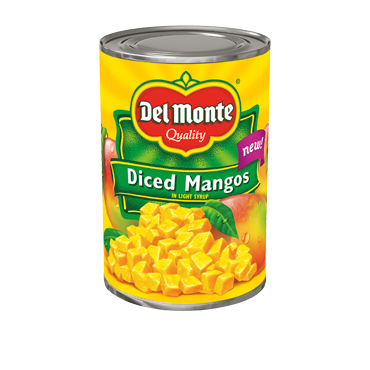 I'm still enjoying having Luigi's Italian Ice, mango flavor for my after dinner treat every night but I've found another mango product that I really, really like... Del Monte diced mango in cans! I have a freezer and fridge on my level of the house but I still rely on a lot of shelf stable stuff. I like canned peaches fairly well but canned mango has that little extra something that really appeals to me. I will pop the lid and eat straight from the can! I know the syrup with canned fruits is not the healthiest thing but again, I think it's healthier than eating a Little Debbie or Butterfinger. 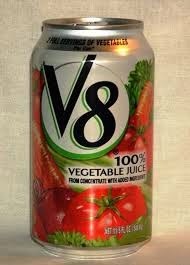 Lots of vitamin A and a little bit of fiber. Win, win! And I could drink a gallon of that syrup! 6. One more food favorite thing... something we refer to as "golf chicken". Barber Foods has stuffed chicken breasts that are so easy to prepare that they would be our go-to meal on the days that Pop was off playing golf (he usually cooks). They come in several varieties and you can buy them raw or precooked. The raw ones have to be cooked in the oven but the precooked can be prepared in the microwave which means... I can have dinner cooked in four minutes - two and a half minutes for the chicken, one and a half minutes for rice! The other night I fixed these for me and mom for dinner when Pop was at church and added brussel sprouts for an extra veg boost. The stuffed broccoli and cheese are my favorite and if you serve them over rice you can mop up the extra sauce with the rice. 7. Now that I'm coiffed and fed I can tell you how I'm passing time every day. I do a little cross-stitch every day and then work on my genealogy stuff and while I'm doing that I like to watch tv. I've been watching a lot of tv over the past few years and periodically I like to bring in shows that are in syndication, especially ones that I never watched while they were first broadcast. Lately my favorite syndicated show is Gilmore Girls. HOW did I miss this when it was first out? Hello, witty single mom raising smart daughter? That's my life... I mean, if you replace the one daughter with three sons. It's cute and quirky and has some really fun running jokes and makes me want to hunt down fictional Sleepy Hollow when I'm in Connecticut in June! There are two episodes broadcast every day and I record them so I can watch them straight through and fast forward through the commercials. I've almost completely been able to see Alexis Bledel as the daughter instead of the crazy lady that Pete Campbell had an affair with on Mad Men. And don't get me started on Mad Men. I'm not loving the way they're wrapping up the series and am certain that Don Draper will end it by committing suicide. 8. Last but by no means least... back in the early days of owning a computer one of my favorite games to play was Minesweeper. If you've never played it, the goal is to mark the "mines" and open all the boxes that don't have "mines". Every box you reveal without a mine will tell you how many mines are surrounding it. So like if the number revealed is three and there are only three boxes touching that box, you know all of them contain mines. It is very logical and also addictive. In preparation for spending time waiting away from other entertainment, you know, in hospital waiting rooms and on planes and so forth over the next few months, I downloaded a version of the game on my Nook. It's not unusual to find me watching a show on my laptop with the tv on and muted with Fox News on, playing minesweeper on my Nook while texting on my phone. Yep, that's me... working up to four screens at a time... of course, I don't do that very long without falling asleep but... yeah. Minesweeper is fun. Those are my current favorite things... what are yours? Anything you want to share? My next update will be all about baby Cosette and I'll be a whole year older then. Thanks for reading and for all your love and support! Love and hugs! Baby fever is spreading like wildfire! Kelly Stamps from Kellys Korner Blog delivered her third child and first little boy on Friday. He was a little surprise caboose for their family train. Two daughters of three of my high school classmates delivered three babies yesterday. Confusing? One couple, who went to school with me, were married for awhile and had a daughter who had twins yesterday. Plus another girl from my high school became a grandma yesterday. Apparently 29 years after graduation is when people who grew up in my hometown become grandparents. That's not a hard and fast rule because some of my former classmates have been grand for awhile. I was among the first to become a parent. I don't mind letting other folks become grandparents first. I'm glad it's my turn now. Reports are that the Duchess of Cambridge (Kate) will be induced tomorrow. Cosette will be in great company. My mom was born two months before Prince Charles and my brother was born a month before Prince William so we have a history of breeding like the royals. I ordered a tshirt Friday night that says, "My favorite people call me ____________". The blank is filled in with the grandma name I picked for myself. I have to know how to introduce myself to Cosette. I had hoped the shirt would be here before the baby but that doesn't look to be the case. Boo hiss. I bought the shirt with a gift card that was a birthday gift from a dear blog reader who is always good to remember me. I was going to use it to buy Dana Perino's book but this shirt caught my eye. And it was very late and I may or may not have been shopping under the influence of ambien. Pop came home from the grocery store Friday night with a pack of size one diapers. For those who are not current on modern day diapers, size one goes from 8 pounds to... fifteen or sixteen, I forget. Cosette is predicted to be about 7 and a half pounds so by the time we get to have her over here she will be about 8 pounds worth of baby and we will be ready for her! My first child's first and middle name used the same letter - Robert Ryan. My first grandchild's first and middle name will use the same letter - Cosette Camille. This was totally by accident. I'm really eager to take Cosette down to see my grandma so we can get a five generation photo. Those are rare. Honestly, my grandma will probably live to be a hundred so we'll probably have lots of opportunities to do this but you never know and I would hate to miss the opportunity. Because Tasha will be induced, the chances are good that we'll be at the hospital for a long time. I intend to stay there as long as it takes. Since regular old chairs cause me a good deal of pain I'm dragging my own chair up there. Not my recliner... I'm taking one of those fold up chairs you use for picnics and sporting events. The seat is fabric so it offers less resistance. I know it will look odd and I don't care. Whatever keeps me in the game. Yesterday and today I'm having a really nasty flare up of the crazy gut pain. I'm two hours into the strongest dose of painkillers I can take and have the old bean bag sock warmed and pressed against me and it's still excruciating. Usually these flare ups last around three days so I'm hoping and praying that it's out of the way for me to be able to hang tough at the hospital. My labor with Ryan took about ten hours (I'm not sure, I need to check his baby book) with a lot of pushing and he was delivered with "salad spoons" (forceps) ten days past his due date. He was 7 lbs and 11 ozs. My labor with Cody took about eight hours from the time my water broke to the time he was delivered. He was about ten days early and weighed 6 lbs, 13 oz. I went into pre-term labor with him at 26 weeks and was able to keep him cooking until full term. My labor with Austin took about six hours from start to finish. He was born about ten days early and weighed 6 lbs, 13 oz. 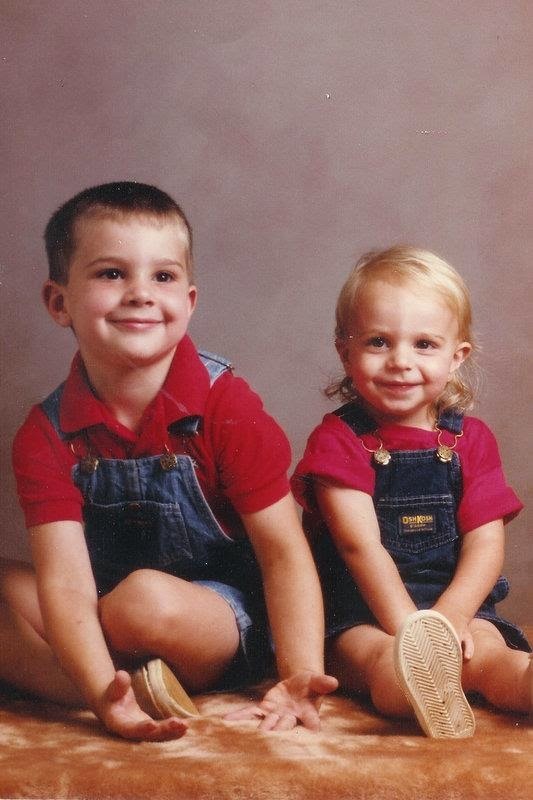 Yes, Cody and Austin weighed exactly the same. Their names are also really similar - Justin Cody and Austin Clay. I went into pre-term labor with him at 25 weeks and was able to keep HIM cooking until full term. My mom had five kids... born in 1966, 1968, 1975, 1978 and 1982. There are twelve grandkids in our family... born in 1986, 1990, 1994, 1997, 1999, 2002, 2004, 2004, 2007, 2009. Two of my brothers married women who already each had a little girl. 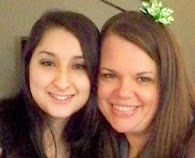 This is why I say that there wasn't a little girl born into our family between me in 1968 and Sarabeth in 2002. I had nieces, we just didn't get to do the "it's a girl" pink frilly newborn baby girl stuff until Sarabeth was born. Sarabeth's nursery was decorated in red and black, the colors of her mom's alma mater. So technically we didn't get to do pink and frilly with her either. My parents have another grandchild on the way but it belongs to my brother who is estranged from the family so we don't know when and we don't have high hopes of knowing this one. I will continue to pray for him/her just as I pray for his/her siblings. We had never thought that my brother Bryan would have children. The girl he was with for many, many years was not able to have kids and we figured he was too busy/didn't really like kids that much. Although, seriously, how many bachelor uncles take their nieces to adopt Cabbage Patch Kids? I'm just sayin'.... Since he is marrying Helen and she definitely wants to have kids, my parents will hopefully have another grandchild or two. When they came in and announced they were engaged the second thing I said was, "will there be children?". I said congratulations first. I'm not THAT baby-greedy. When Helen marries into the family she will become an aunt and a great-aunt simultaneously. Without the work or the wait! How lucky is she? She is already a pretty amazing aunt - including my nieces as junior bridesmaids and giving generous, lovely gifts to her great-niece and great-nephew. If my boys had been girls their names would have been Ashley Elizabeth, Alyssa Ray and Cailen Brooke. If I was having kids now I would have picked out family names/ names with meaning instead of trendy names. Ray is my mom's middle name and is the last name of her maternal grandmother. Yes, my mother's name is Norma Ray. Remember the movie with Sally Field? Tasha has requested that nobody post any pictures of Cosette on social media until she has a chance to. She wants the scoop and she definitely deserves it. So if I am short on details/photos immediately after Cosette gets here, please know that I am not "vague-booking" but honoring her mama's wishes. I'll get it all out there as soon as I get the go-ahead! In the wee, pain-filled hours of the early morning today I thought that it was Monday and thought, "Cosette will be on her way TOMORROW night". Then... as I was flipping the channel to Fox and Friends First (which comes on at 5am on weekdays) and noticed it wasn't on, I remembered that today is Sunday so it will be two more days before we get things under way. I was a little bummed. Instead of going out to eat for my birthday this year we're having Taco Tuesday before we go to the hospital Tuesday night. I had already asked for Taco Tuesday before we knew Cosette was coming then. Wednesdays my dad eats dinner at church so Tuesday was the closest to my birthday that we could celebrate anyways. We're going to have so much eating out and so many expenses with the wedding coming up... and.... knowing I was going to be doing some hospital sitting soon, I didn't want to tax my back with restaurant sitting. It works out well since we will be up at the hospital Tuesday night. Apologies to those sharing the waiting room with us. And now my fur-baby is requesting my undivided attention so I'll leave things here. Love and hugs, y'all! It's a little after 2am and I'm wide awake. I had a busy day yesterday and crashed fairly early - maybe even before 8pm. I woke up at 10:30 WIDE AWAKE and have been awake since then. I figured I should get some of the information I received yesterday committed to paper/computer screen before I forget or lose context. It was a busy day, for real. So yesterday was my follow up with my general practitioner to go over possible causes for the crazy gut pain. Just for the record... I've been having pretty severe pain in my lower left side, right in front of my left hip, in fairly consistent cycles for about 20 months. For many, many months I wondered and worried what this could possibly be but couldn't afford any extensive medical exams or testing because I'm still one of those folks who don't have affordable health care. Or insurance. Or medicaid because it wasn't expanded in my state. The pain has been particularly worrisome because the pretty strong pain meds that I take for my back and other pain issues haven't been able to cover the pain. And side note, if you're local to me my doctor is, quite possibly the best in the area and certainly the best doctor I've ever had - and I've had quite a few. Here are some of the known issues that I have that could contribute to pain in the general area of the crazy gut pain: fibromyalgia, herniated discs/degenerative disc disease/osteoarthritis, sciatica, piriformis syndrome, interstitial cystitis, a small ovarian cyst, fatty liver disease (non-alcoholic, just for the record) an umbilical hernia. Many Most All of these can be contributors to discomfort. I do have random pain that isn't isolated to the exact area of the crazy gut pain but the cgp is always located in the exact same location. Always. We have eliminated so, so SO many potential pain issues in that area. I'm fine from a gyn standpoint which was first and greatest concern. The cyst I have is small and hasn't changed from when it was first noticed when my back pain first started four years ago. We have ruled out diverticulitis or any other scary intestinal stuff. I do have pretty sluggish bowels due to the meds I'm on, pain meds in particular slow things down. Gallbladder checks out fine so no referred pain from that. Same with appendix, it's on the opposite side but no referred issues there. After a looooong discussion with my doctor today we're going to treat some of the smaller issues to see if we get a cumulative reduction in pain. I'm being treated for irritible bowel syndrome as those meds will keep things moving at a healthy rhythm. They're sending me to the urologist to get the interstitial cystitis back under control. He's also starting me on an anti-depressant because there is such a close pain/depression relationship. One causes the other in most cases. The only thing we don't know is whether the pain is related to my back problems. It could be a compressed nerve, something as simple as that. But we can say with some certainty that there is no singular major issue causing the pain and I guess I'd rather have pain for no good reason than have pain because of stuff being scary wrong. It's frustrating news but it's not bad news. Enough about me. That was just the first part of my day. I left my dr and went to pick up prescriptions from my mom's doctor for her. They wouldn't give them to me which was a huge aggravation. The receptionist was rude and I'm just over those people. Then I went to pick up a few groceries and sneak at peek at Austin on his first day as a bagger at our local supermarket. I really needed to pick things up but.... yeah, I wanted to check up on him. He asked me to make sure I went with Tasha to her doctor appointment since he couldn't go and I agreed. Tasha's doctors office was crazy busy and way behind schedule. We waited FOREVER but it's ok because it's our last prenatal visit. After much discussion with Tasha's midwife they've got her set up to be induced on Tuesday night, starting at 9pm. At the beginning they just administer stuff to get the cervix favorable for a few hours and then they start the pitocin. Her midwife will come in around 8 to check her and break her water and then it's just... go until she gets here. This means that Cosette will likely be born on MY BIRTHDAY!!! It's going to be painful for me to sit around all of that time but my mom and I will camp out in the waiting room and be there until we get to see a baby. I'm planning to take one of our outdoor chairs because they have enough give that it doesn't hurt my back as bad as sitting in a regular waiting room chair would. And I'm planning to take my pain meds because... childbirth shouldn't be painful for grandmas. We left Tasha's doctor office and went to try again to get my mom's prescriptions. I won't go into the details of all the drama they put her through but I tell you what, if you are a pain patient you are treated like a criminal, you and everyone associated with you. It's quite frustrating. And every time my mom needs prescriptions refilled the procedure has changed from the last time. I hate all the money we spend for me to go to the pain clinic but honestly, they have a very upfront process and never make me feel bad. Around the time my mom walked into her dr office I called Austin to see if he knew when he was getting off work because somebody would need to pick him up. It turned out that he was just then leaving. He had started work at 10 and by this point it was around 3:30. He didn't have money to get lunch so he had not eaten all day. My mom realized that her quick stop to pick up prescriptions was going to be more of an ordeal so I went ahead to pick Austin up and get him something to eat. He had gotten enough in tips to buy his own meal! Yay! Mom's doctor's office is only about a mile from the grocery store where Austin is working so it wasn't like I was driving all over town but I did have to go back to get her after I got Austin and drove through the DQ to get him a bite. It was just that I had been through two extended doctor appointments already in addition to buying groceries and I was in so much pain and was dying to get home. My mom was upset, I was upset but the news that Cosette is going to be here next week really lightened the mood. I did have to explain the induction process to Austin since he wasn't at the dr. appointment. I think that was more birds and bees talk than I have ever given any of my kids. You know it's a weird day when you discuss softening the cervix with two of your male children (because later I had to explain to Cody as he and Marquee are trying to be able to come up and be there when Cosette is born. I didn't want them to have to sit through all that cervix softening). At any rate... Little Kitty is protesting the fact that there is a laptop on my lap where he wants to be. I still need to email my attorney to update him about my dr appointment because I have a feeling that not sleeping tonight is going to make for a fairly grumpy and unproductive day tomorrow today. We're having hardwood floors installed on the main level tomorrow so.... yeah.... don't think I'll be catching up on my beauty sleep so I should be more than fairly grumpy! I went ahead and called in all my prescription refills and washed grapes to snack on while I'm awake. It's got the cats all confused. This is supposed to be sleepy time. I'm listening to the Broadway channel on the satellite so it's been kinda fun or at least not miserable. So good night/ good morning, whatever. Love and hugs! Austin starts his new job tomorrow. I'm still afraid to jinx it but if you're local, you'll probably see him. Today we're getting his hair cut so he's not shaggy. Austin has really thick hair and if it grows out it doesn't get long, it gets tall like a white-boy afro. Really, really hoping this works out for him and that he realizes how working can change your life. Also don't want him to waste any more of his prime earning years. You never know when that time will end. Tasha is miserable and ready for Cosette to get here. They brought me a diaper bag yesterday so that I have supplies for when Cosette is here. They're (Austin and Tasha) having a hard time convincing her mom that they don't want anyone in the delivery room but them and medical people. I've said all along that wherever they want me to be, that's where I'll be. I never had anyone else in the room for delivery but I liked knowing people were close by. I started working on the Grandma memory book for Oliver that Cody and Marquee gave me when they announced their pregnancy. Apparently I'm terrible at following directions because I messed up an entire page by using the wrong perspective. I thought it was asking about the baby's parents but it was asking about grandma's parents. Got to pick up some white out. Austin said, "you did it in ink?". Yeah. It's for posterity. Austin has really bad handwriting so he's aware of these things. I've been nagging them about some thank you notes and Austin says he can't because of his handwriting. From my perspective it's about handwritten something that says thank you. If it's neat that's fine but nobody is judging what it looks like, just that it is done. We had a rainy spell and once again we had water in the basement. I can't even tell you all the things we have done to prevent rain from getting in the basement... it's working to some degree because the water didn't come in the back wall behind my nest, it came in the far edge of the house. We can tell we're on the right track but still had a few days of things being moved out of place and wet towels being carried upstairs (not by me, I learned my lesson two years and about five floods ago). Apart from rain, we've had some really lovely Spring days. It's still getting a tad cool at night but we've been leaving the windows open. Last night felt super chilly and I checked the temp - it was 42 degrees. I'm sleeping in a sweatshirt tonight. I do love to breathe cool air and would always rather be cold than even the slightest bit warm. I took Austin for a haircut and while I was there I got my brows waxed. I was really embarrassed to admit that it has been three years since I last had them shaped up. It was time to give up the Muppet brows! Plus, we don't want my future sister-in-law's friends and family to think we're complete Neanderthals down here. What was that line in Steel Magnolia...? Something about taking the dishes out of the sink before we pee in it? At any rate... I forget how much better it looks and how bad it stinkin' hurts! Well worth $7 plus tip. One of the unexpected by-products of having two grandbabies and a wedding within the space of three months is all the boxes we have been accumulating! We've gotten baby gifts and wedding clothes and of course, all the plants my parents have shipped here for planting. The cats think they've died and gone to cardboard heaven! I might have enough to build me another Cardboard Castle - which, for those of you who haven't been around as long, was what I used to call the double wide trailer we used to live in. One annoying thing that has happened this week is our cellphone reception is pitiful when we're home. I can't send or receive calls or texts except randomly if I'm standing facing the West with the phone over my head whilst standing on one foot. Approximately. Two grandbabies cooking and a wedding and baby shower happening AND my birthday happening and I can't get calls or texts? Epic #fail for A T & T. It's not just our phones/service, Tasha couldn't get hers to work when she was here yesterday either. By the way, finding a way to use the word "whilst" in a sentence made me geek out a little. Too also plus, I might have slipped in the whole "birthday" thing in there as well. I always geek out on birthdays! Oddly, the first birthday card I received this year was from my first mother-in-law. She has recently been put in a home and her brother contacted me to get updated information on the kids, which I happily shared. She's sent cards and letters to all of them and to me. For a split second it makes me feel bad that thirty-something me didn't do more to foster and encourage the relationship between my kids and their "other" grandma, especially with me becoming the "other" grandma myself here shortly. Then I give myself a break and remember that I was far too busy raising three kids and working more than one job and trying to keep all my plates spinning to nurse and nurture a relationship that was never that secure in the first place. Also, I kind of see it as the responsibility of the parent to make sure their kid has a relationship with THEIR parent(s). I did my job. My kids go to Mawmaw and Pop before they go to me with a problem. Austin and I are very close and we have a lot of deep talks (much more here lately... I could do a whole blog series on young parents with Asperger's.... men with Aspergers supporting their pregnant partners.... etc) we're close but they definitely see Mawmaw and Pop as people who love them unconditionally. Probably, most likely, my kids' "other grandma" does love my kids, at least the idea of my kids, very deeply. I wish she could know them because I think they're all pretty neat human beings. Not perfect... but complex, interesting, intelligent, sensitive, creative, ambitious, diverse, kind, lovely human beings. I wish she knew that. Her brother helped her print out photos of the boys from my Facebook account (which I'm perfectly fine with) and she has them on her wall there in the nursing home. She's had a hard life. Her first husband died in Vietnam when she had a three month old baby. She's had health problems and problems with depression. Her second husband ended up being about the biggest loser you could ever imagine. I mean, yes, Darby did a real mind f&*% on me but her second husband KIDNAPPED, BEAT and ROBBED her step-mother and is now in jail for it. I don't feel connected to her other than the fact that she's my kids' other grandma and now she will be Cosette and Oliver's great-grandmother. She lives walking distance from Cody and Marquee (not that you would walk in that part of town because it is not safe) and there is the possibility for them to be involved in her life but that's for them to decide. Austin wants to take Cosette to meet her. Austin is insulated in some ways because he has no memories of the other grandma - good or bad. He also subscribes deeply to my theory that the more folks that love your kid, the better off they are. But we're a hundred miles from her. The kids don't drive and I don't travel well. So anyways... those were some things I wanted to blog before I forgot. I've also been working harder on my genealogy stuff over the past few days because I've got a book idea and I'm trying to wrap up some of the loose ends - look at additional information and more carefully review geographical locations along with the time periods where my family lived in certain places. For instance, there's a branch of my family tree that was in Essex County, Massachusetts at the time of the Salem Witch Trials. Was there an accused witch in my family tree? A witch accuser? It would be interesting to know. I have a branch of the family that lived in New Rochelle, NY, which is very close to where we'll be for Helen's bridal shower in May. We have basically 36 hours there so we won't be doing any sightseeing but I wanted to just have the background. Tomorrow I see the dr in the morning about the crazy gut pain. Tasha sees the dr in the afternoon about a little gut thing she's got going on (like... you know... a human living there). And that's about it for now, I guess. Hope you're all well and happy and if you need birthday present ideas... I really want Dana Perino's new book. Eddie says, "Hey Trouble, check out my cool pet mouse!" Trouble puts a smackdown on Eddie. Trouble plays with toy mouse. So what's up, y'all? I try to make sure I don't let more than a week pass between blahg entries so that I don't completely tune out and hibernate. We've had some lovely warm spring days for the first stretch of April but the past couple of days has been cooler and rainy making me want to pull the warm woolies back out from the depths of my unorganized closet and sleep for days. I might have slept eleven hours last night. It's not like total hibernation because I go to the bathroom every two hours or so and the cats can't go without food for more than an hour at a time and the stray cat, Rosalita, arrives promptly at 7am for breakfast every day but I have been nodding off early in the evening and staying in my covered nest until I feed Rosalita. (That run-on sentence left me out of breath!) So it's accumulated sleep time, not uninterrupted sleep time but nonetheless, it's extremely sedentary. It feels like the calm before the storm around here. We had some company this week, my mom's brother John and his wife Gerri popped in for a visit while John's son Jason was here with his lovely lady friend Sandy. I was in fairly deep hibernation mode but did manage to climb the stairs a few times during their visit. I always invite people to the Whine Cellar - it has the best view, after all - because it's so hard for me to be sociable when I'm uncomfortable and nowhere in the world is as cozy as my nest. Jason and Sandy plan to come back this Summer so we'll have longer to visit then. Calm before the storm, though, as we are right on the precipice of some very exciting things in our family such as Cosette's birth, the Gant Girl trip to New York for Helen's shower, new hardwood floors on the main level of the house, the Gant Family trip to New York and Old Lyme, Connecticut for the wedding, Oliver's birth and then my disability hearing. You may notice that the disability hearing comes at the very end of all of these events and not smack dab in the middle as originally planned. My new hearing date is August 5th which fits nicely into my schedule without interrupting any major life events. So as the days tick slowly by with lots of random sewing and tv watching and repetitive-ness (is that a word? who knows...) we are quickly approaching a lot of out of the ordinary events and are trying to slowly and gently prepare. 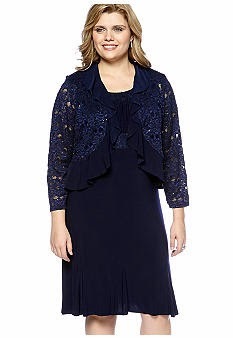 One major task off the *must do* list was buying a dress for the wedding. I have four major wedding events to participate in - shower, rehearsal dinner, wedding/reception, brunch the day after the wedding. All four require me to dress in something other than my usual yoga pants/baggy shirt wardrobe. I have a lot of casual dresses so we're good for two of the events plus the theater (which, I don't dress fancy for the theater but I don't wear jeans either, you have to respect the institution, I believe). I have a couple of dressy/could do in a pinch dresses that may need a little alteration or accessorizing but honestly, what better excuse to buy a dress than a wedding, right? And I think if I wear the same dress that I wore to Cody and Marquee's wedding five years ago it would be kind of sad. I've had many Facebook conversations with my future sister-in-law this week and I've drastically overused the word "excited" to the point where if I was a drinker, I'd take a shot every time I say it. I desperately need to break out the thesaurus. My mom has also picked out a lovely dress, also from Belk, also half priced from what it was last week so we're excited. Oops. Again. I still haven't tried on the slacks I plan to wear for the shower and matched them with something but I want to make that trip as light as possible since it's a quick 36 hour jaunt to New York. We'll see. Short girls don't always look good in slacks, especially since I have the extra vertebrae which makes my torso abnormally long compared to my legs. I always try to wear empire waists so it's not noticeable. Our plane tickets are purchased. Grandma's arrangements have been made (and we are so grateful that my aunt and uncle are traveling with her because I think my dad has enough to worry about between me and my mom). There's still some ambiguity about what to do with Oscar while we're gone. We thought about taking him but the airline restrictions are so narrow and he is really high maintenance and doesn't play well with strangers. Austin and Tasha plan to be here but Austin starts work (!) next week (details on another blog, I'm afraid to jinx it by talking about it) and taking care of both dogs is really a lot of work so my parents are entertaining the thought of a dog sitter to help out. Mom and I need haircuts, I need makeup because honestly, I haven't worn foundation in years and I don't wear makeup every day... things like that still need to be taken care of. And of course there's a baby coming any minute now. Tasha is dilated to two now and Cosette is head down - seriously, it could be any day! I'm also on prince/princess watch because you know I care about these things way more than I should and have I mentioned that I have a birthday this month? When I'm busy I tend to blog more because there's more to talk about than my health and the weather so I'm looking forward to sharing all the fun with y'all. And that's about it for now... hope you're doing well! Love and hugs, y'all! Where have I been all week? Which will come first, my 47th birthday or my granddaughter? Will I be able to reschedule my disability hearing? What's up with the crazy gut pain? but I was younger then. Speaking of being younger, I had a CT scan with contrast yesterday. I should have the results at the beginning of the week. At this point all we've done toward diagnosing the crazy gut pain is just eliminate what it's NOT. I don't want there to be anything wrong with me but ... you know it's the kind of situation where you need an explanation for the pain... you need it to be validated. It's not yet. goes back next week to the perinatologist and then to the regular ob so no updates on Peanut this week. We got the pack-n-play last week so I'm all set to start granny-ing, just need a baby or two! I'm taking a break from sewing today because I'm having really bad pain in my hands (and typing isn't helping). I'm planning a Gilmore Girls mini-marathon and catching up on my "watch later" you tube videos that I have accumulated. Basically, I plan to spend the weekend being a couch potato. Recliner potato. Whatever. Hope you all have a safe, happy and blessed Easter/Passover weekend. Love and hugs!